Sacred Heart Secondary School, Clonakilty, team members Annie Condon, Emma O’Driscoll, Daire O’Brien, captain; Sinéad McCarthy and Jessica McCarthy, who represented the squad at the presentation of the Rebel Óg monthly award for March at a function at the Clayton Hotel Silver Springs. SACRED Heart Secondary School Clonakilty, winners of the Munster and All-Ireland camogie titles, are the March winners of the Rebel Óg Monthly Awards, sponsored by the Clayton Hotel Silver Springs, Cummins Sports (award sponsors) and in association with The Echo and RedFM, media partners. The campaign began when Sacred Heart faced Midleton in the first of a trilogy of games between the two teams. and this was not to be their last meeting of the campaign. The first meeting took place in Ahamilla where Sacred Heart ran out 4-9 to 1-5 winners in the first group match. In the next group game, they travelled to University Limerick where they had a convincing 4-0 to 1-1 win over Laurel Hill on a very fast 4G pitch. They then travelled to Bruff where they beat St Flannan’s of Ennis 6-12 to 2-5 on a very blustery day. These victories left Sacred Heart top of their group and awaiting a Munster sem-final. Charleville provided the venue where the Clonakilty side were pitted against Scariff. Having suffered a few losses to the Clare outfit over the previous four years, the Clonakilty girls were determined to rectify those defeats and were in control from the outset and had a commanding 7-7 to 3-2 win. Midleton were finished as runners-up in the group and were paired against Nenagh in the other semi-final. The east Cork outfit fulfilled their promise and beat the North Tipp kingpins, meaning Clonakilty would meet their old foes on in the Munster final day. Clonakility’s victory set up with an All-Ireland semi-final against Coláiste Bhride, Enniscorthy. Clonakilty had to travel to the Leinster champions’ home ground on the first Saturday in March. The Cork ladies showed tremendous courage, passion, and skill on the day and dispatched an excellent Wexford, side on a scoreline of 1-5 to 0-6. Midleton, as Munster runners-up, had a chance to redeem themselves as they accounted for Dublin A Champions, St Dominican’s in the other semi-final. This left both Cork teams pitted against each other for a third time in this competition, with the chance to lift the All-Ireland Cup. Castle Road was the venue. Millie Condon was sublime on the day and netted two first-half goals. This earned her the Player of the Match Award. Others to shine on the day were Sinead McCarthy, wing-back Jessica McCarthy, Caoimhe Murphy and Eimear O Brien. 3-8 to 1-7 was the final scoreline. Rebel Og County section have two finals on the cards with Carrigtwohill and Clyda Rovers meeting in the final on Wednesday and Caha Gaels and Mayfield in the U15B1 final, Full details below. Rebel Og County U15 championship programme. Full details of the draws, fixtures and results are below for the U15 championship at A, B1 and B2. Today is a big day for U14, U15 and U16 squads as they take part in different competitions around Munster today. 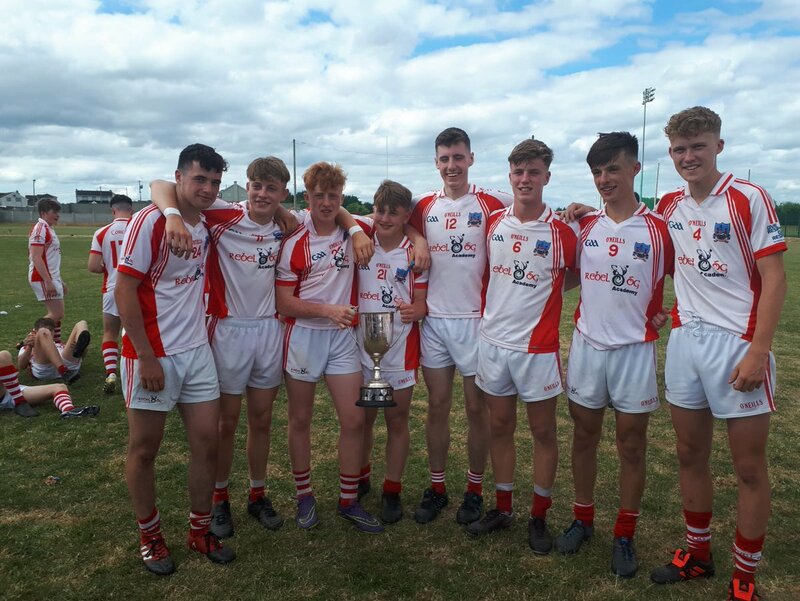 On the 7th July, the Rebel Óg football development squads competed in Munster Competitions at u14, u15 and u16 lage grades. 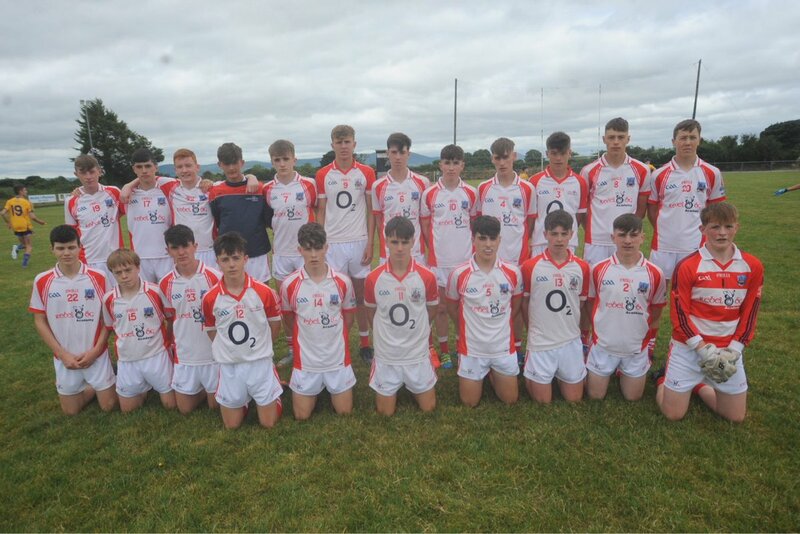 The Cork Football teams captured the u15 and u16 tournaments while the u14s competition is entering its second phase on the 28th July with 2 out of the 4 Cork sides in contention for victory. The U16 “White” squad won their tournament in Limerick beating Limerick, Kerry and Tipperary. The manner of victory was particularly pleasing given the very attractive style of free flowing football on display. Cork were the only county to have entered 2 panels for this competition. The “Red” squad also produced excellent football on the day but came up short against Tipperary in their first game before beating Clare and Waterford to reach the Plate final. The U15 West squad won the Humphrey Kelleher Tournament beating Limerick and South Kerry before brushing aside the challenge of North Kerry in the final. The Cork East squad beat Clare before losing to North Kerry by 1 point after extra time in a thrilling semi final. The two Cork panels were split geographically with the West consisting of players from Carbery, Beara, Carrigdhoun & Muskerry. The East squad comprised of players from Avondhu, Duhallow, Imokilly & Seandun. The East squad can feel somewhat aggrieved not to have made it to the final given the amount of unconverted chances they had in the North Kerry game but overall, the management teams in both squads know they have a competitive group of boys and have quality players at their disposal based on performances on the day. 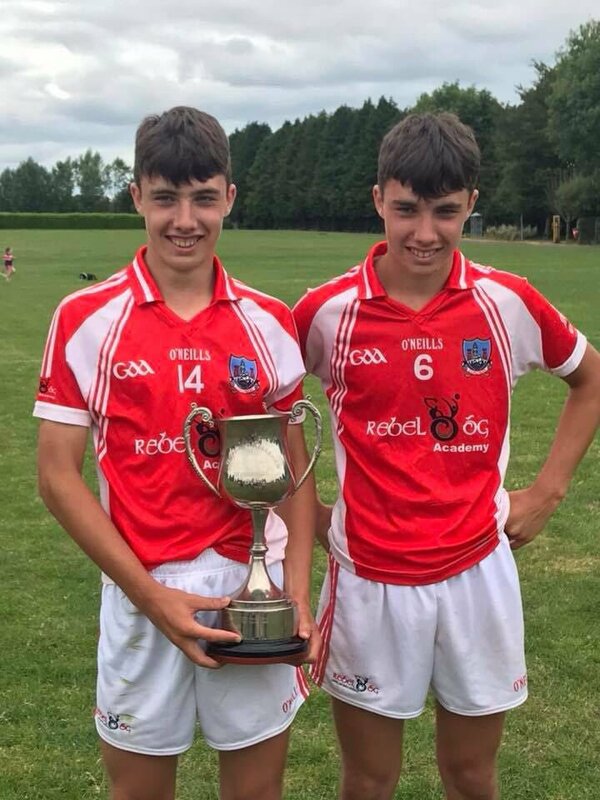 They will be in action again on the 28th July as a qualifier blitz for the Adam Mangan Tournament in Offaly so their focus has already moved to that. There are still deficits in the system but perhaps the future of Cork Football is not as bleak as some people might believe this week. Well done to all the players, their clubs and mentors involved with these groups, nice to get some recognition for the hard work and commitment to the cause. Cúl Camps are currently under way and over the summer months Rebel Og will be trying to share some of the magic from each camp. Day 3 of @BoherbueGaa Cúl Camp! Rebel Og held the draw for the County U15 A, B1 and B2 Football Championship. Full details of opening round draw and dates are below. Round 1; Wednesday 18th July @ 7.30pm ( Home team listed first). These games may be played earlier by agreement between the two clubs. Semi-Finals; Wednesday 25th July @ 7.30pm. ( Home team listed first). These games may be played earlier by agreement between the two clubs. St. Dominics v. Winner A. The draw has been made for the 2018 Jim Power Tournament which will take place on the 7th and 28th July 2018 in Dungarvan GAA Grounds and Bushy Park. Looking forward to the new and expanded format. Games 20 mins aside . The draws which see’s four Cork teams in action for The Bank of Ireland Celtic Challenge 2018 Quarter Final’s taking place on Sat 16th of June have been made as follows. The Cork minor football team for tomorrow night’s Munster Championship game v Waterford in Pairc Ui Rinn has been announced as follows. At the last board meeting of Rebel Óg West, the championship draw for 2018 took place. Below are the full draw details. 4. Dunmanus Rovers V Castletownbere. 2. Owen Gaels V Clonakilty. B) Kilbrittain V Bantry Blues. 4. Ibane Gaels (2) V St. Colums. 2. Laochra Óg V Western Gaels. Under 14 B2 football and hurling draws deferred until a later date. Please find attached fixtures for week beginning Saturday March 31st. Any agreed amendments to next weeks fixtures should be notified to me by email before 8.00pm on Wednesday next March 28th. Any refixtures of unplayed games should also be forwarded to me before that time so that the website can be updated and I can forward an amended list to the clubs. is not included please contact me immediately as all of the leagues will be drawn up on Tuesday night, March 27th. Rebel Og have announced details of dates for 2018 Feile Peile and Feile na nGael competitions. Qualifying Rounds on Saturday 21st April with Semi Finals and Finals taking place on Friday 27th April. Qualifying Rounds will take place on Saturday 5th May with Semi Finals and Finals on Monday 7th May. As a result of the recent spell of very bad weather including heavy snowfalls, and ice cold winds many grounds are still in recovery mode and club’s may find it difficult to host a Group of Feile na nÓg fixtures this coming Saturday. These fixtures would require grounds to be able to stage 2 games at the same time with 8 to 10 games in all required to complete the group. While today is a good sunny day the forecast for Thursday and Friday this week sees a return to rain again which may see grounds being unavailable were the programme to stand. Coiste na nÓg have decided therefore to cancel Saturday’s fixtures so that late cancellations can be avoided were the fixtures programme to stand. A rescheduled date will issue by Friday Next 23rd March 2018. After having week two of Rebel Óg postponed due to snow recently, it was the turn of week threes fixtures. Below are the results from games that took place. Due to the extreme weather conditions that are currently prevailing all Minor League games scheduled for the coming weekend have been postponed. The entire round will be refixed for Monday March 19th. Rebel Og competitions are coming to the end of their terms with semi-finals and finals taking place in most competitions. All league programmes are at their knock out stages. Below we will look at the results form games that took place over the last seven days. Adrigole v Castletownbere in Adrigole Tom Barry 4.00pm. 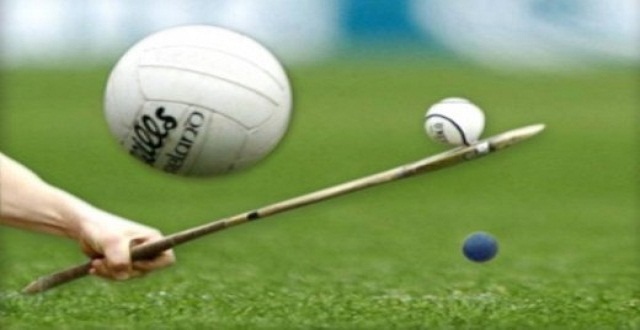 Tracton v Shamrocks in Minane Bridge M.Harrington 4.30pm. Iveleary v Ballingeary in Iveleary T.B.C. 4.00pm. St. James v Ballingeary in Ballingeary O.Burns 3.00pm. Kilbree v Western Gaels in Kilmichael T.B.C 12.30pm. Macroom v Kilbrittain in Macroom T.B.C 7.00pm. Ibane Gaels v Ahan Gaels in Barryroe T.B.C. 7.00pm. Minor B 1 Football League Final (2) : Macroom/Kilbrittain v Ibane Gaels/Ahan Gaels. U.16 B 2 Football League Final : Kilmichael v St.Colums in Kilmichael( 4th/5th. Nov). Rebel Og Results from the past seven days are in. Check them out below in a week that a number of County and Regional titles were given out by Rebel Og. Extra Time 10 minutes a side in all Under 13 games, if sides are still level following extra time, referee restarts the game and first side to score is declared the winner. Results from Rebel Og competitions that took place over the past seven days. Sunday September 17th.U.16 A Football (Prov.) Alt. Tues. 19th. Please find attached championship fixtures for the next few weeks. A meeting of the Rebel Og West Region will take place on tomorrow Wednesday September 13th. in the G.A.A. Pavillion , Dunmanway @ 8.30pm. C.C.C. meeting at 7.30pm. All clubs still left in championships shouid be represented at this meeting as no changes to the proposed dates can be entertained after this meeting. Uibh Laoire v St. Colums in T.B.C. T.B.C. T.B.C. Naomh Aban v Gabriel Rangers in T.B.C. T.B.C. T.B.C. All clubs still involved in championships should be represented at the West Region meeting on tomorrow Wednesday at 8.30pm. Rebel Og Results round up from the past seven days of games. Newcestown v Ballinhassig in T.B.C. T.B.C. T.B.C. Kilbrittain v Newcestown/Ballinhassig in T.B.C. T.B.C. Please note that in the event of a draw extra time must be played except in Championship Finals. This is now general Rule. Failure to agree to extra time may mean expulsion from the competition. Attached are fixtures and referee details for under 12 1st round and quarter final games. U12 b final Newcestown v Bantry in Ballinacarriga monday night 6.45pm. U12a shield semi final Kilbrittain v Barryroe is on saturday morning at 12 noon. Any queries please reply to this email or text me. All Quarter-final games fixed for Saturday September 9th @ 3pm. Clubs by agreement may change date and time to Sunday 10th or Monday 11th. Home club responsible for contacting referee to ensure he is present at right date and time. All clubs asked to text results immediately to PRO (086) 2371388). Clubs who do not play games or put them off will be removed from all competitions at U12 football. We must stick to the schedule agreed at last Board meeting. U12 Hurling games not played and U14 competition not accepted as an excuse. We want all Under 12 activity finished on schedule for end of September. Semi-final of all competition will be fixed for Saturday 16th and finals the following weekend. Fixtures up on rebelóg.ie (West Section). Draw for the County Section of Rebel Og Championship at A, B1 and B2. Herewith List of Championship Draws for the Inter Regional Stages of the Minor, Under 16 and Under 14 Championships (Hurling and Football) 2017. As a result of some alterations to some Soft Borders in the Regional Championships it was necessary to also make minimal adjustments to the Inter Regional Championships. Tonight in Rebel Og West some big finals tool place. Down for decision were A and B title. Since the introduction of the soft boarders which has seen some clubs from other regions move into the Rebel Og West. Tonight saw the first of the new teams to win a title when Kinsale won the U16 A title. Also tonight, Kilmeen won the U16 Hurling title as well when they beat Ahan Gaels in the decider. We have had some busy days in Rebel Og over the past seven days. Below are some results from the games played. Cork 1-19 v Galway 1-11 Cork win cup final after extra time. Cork v Tipperary draw at full time 0-13 0-13- Cork won 1-0 in penalties. All clubs should be aware that extra time should be played in all games in the event of a draw. This is now general rule and failure to comply with it may result in expulsion from the competition. The exceptions are championship finals unless already stated. In the event of failing light the decision is made by the referee.